On February 1, 2011, Arizona Attorneys for Criminal Justice, a statewide not-for-profit membership organization of criminal defense lawyers, law students and associated professionals, released Turning the Corner: Opportunities for Effective Sentencing and Correctional Practices in Arizona, a report prepared by Justice Strategies' Director Judy Greene. With a state corrections budget of $1 billion dollars threatening cuts to education and other important human services, Turning the Corner points Arizonians to important reforms in other states that have reduced prison populations while maintaining public safety. Through expert analysis and first-hand testimony from children, parents and care-givers, Children on the Outside: Voicing the Pain and Human Costs of Parental Incarceration uncovers the devastating impact of parental incarceration on youth and the broader community and points to smart approaches to reduce prison populations and assist children. This new Justice Strategies report provides first-hand accounts of the harm experienced by some of the 1.7 million minor children with a parent in prison, a population that has grown with the explosion of the U.S. prison population. As the Obama administration steps up efforts to deport immigrants held on criminal charges, federal officials in New York City have long been on the job. At the city’s main jail on Rikers Island, immigration officers comb through lists of foreign-born inmates, then question, detain and deport about 3,200 of them a year. For twenty years, Federal immigration officials have been stationed on Rikers Island. Critics say the Department of Corrections offers them too much assistance in identifying foreign-born non-citizens, some of whom end up in deportation proceedings. The practice came under fire Monday during a City Council hearing. Critics say all too often immigrants who are in detention, but have not been convicted of a crime, are reported to ICE, the U.S. Immigration and Customs Enforcement. Justice Strategies is conducting research for a forthcoming report on the combined impact of drug laws and immigration enforcement on jailers, prisoners and taxpayers. The New York City Department of Corrections provided Justice Strategies with a database of all discharges in 2008. We analyzed the dataset of noncitizen prisoners whose top charge is a drug-related offense. While Homeland Security purports to target the most dangerous offenders, there appears to be no correlation between offense level and identification for deportation. In New York City, Homeland Security detainers are enforced in such a fashion as to effectively terminate the bail rights of certain pre-trial noncitizen prisoners. Controlling for race and offense level, noncitizens with an ICE detainer spend 73 days longer in jail before being discharged, on average, than those without an ICE detainer. Eight Corrections Corporation of America detention centers that house asylum seekers and immigrants awaiting deportation may be line for makeovers to create a less prison-like feel. 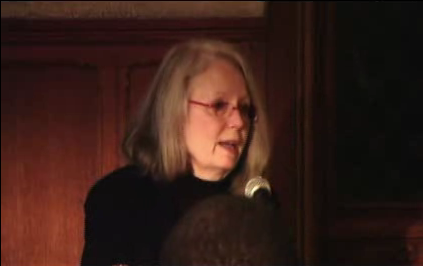 Presenting at a forum on gang wars in Cleveland, Judy Greene argues that traditional gang enforcement tactics like gang databases fail to enhance public safety. New York City, which has moved away from heavy-handed gang enforcement approaches, has managed to lower crime by focusing attention on guns rather than gangs. A new Christian Science Monitor article cites Justice Strategies’ research on the federal immigration act, 287(g), which may have served as a precursor to the widely denounced Arizona immigration law. A new report by the Pew Center on the States shows that while the national prison population declined last year for the first time in 38 years, Pennsylvania's number of inmates increased more than any other state's. Many state governments continued last year to reduce their prison populations through sentencing reforms enacted because of shrinking state budgets, according to two reports released Wednesday by a research group that advocates for lower rates of imprisonment. In 2009, at least 19 states adopted criminal justice policies intended to cut down on the number of prisoners they house by shortening sentences, according to the Sentencing Project. For example, Minnesota, New York and Rhode Island each scaled back mandatory sentencing laws for some drug offenses. Three states -- Michigan, New Jersey and New York -- reduced their prison populations by at least 12 percent in the past decade by making similar changes, according to state public safety data cited by the report. Those states saw no increase in crime, according to the report.